classical.guitar - One of today’s most popular classical instruments, played by great artists like Segovia, Bream, Williams, Fisk, Guillén, etc. Most of the famous modern composers, like Britten, de Falla, Brouwer, Martin, Cibulka, Duarte, Koshkin, Pesec wrote special compositions for this instrument. It is all the more astonishing that it is virtually impossible to find a library featuring samples which support the full range of a classical (nylonstring) guitar. project.jovaluna To remedy this deficiency, Jovan Pesec, composer & founder of vision4media.net (v4m.net) initiated the project jovaluna classical.giga.guitars. Its goal is to transfer the individual character and sound of three famous and excellent classical guitars to samples libraries. The sound of a guitar is highly sensitive, naturally, not looped. So I decided to record each and every note of the guitars in at least 12 different “dimensions” (playing techniques). The samples were recorded with SONY DAT TCD-D3 and AKG C567 MICs. Hard disk recording & sample preparation was done with MOTU 828 and CoolEditPro. The libraries have more than 400 MByte and were programmed with Nemesys GigaStudio Editor. 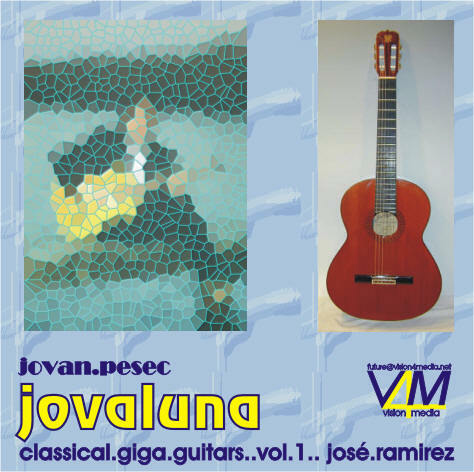 vol.1..josé.ramirez, recorded on a brilliant concert guitar by this famous spanish guitar maker, performed by Juan Francisco Pedestro, will be published November 2002. Other instruments will follow soon.